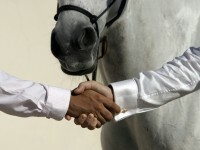 HoofbeatZ™ regularly invites equestrian experts from all over the world to give lectures, master-classes and workshops. These include all aspects of horsemanship from horse therapy workshops to Dressage. Annemeick Raaijmakers October 8-12th 2012 To book or ask for information email us.